The head of Lebanon's Hizbullah said on Tuesday that he had the backing of Iranian President Mohammad Khatami, despite U.S. demands and pressure. Speaking to the movement's TV station, Al Manar, following his meeting with Khatami, Sheikh Hassan Nasrallah said there was no daylight between him and Iran. "You know that Iran is being subjected to similar threats, under various titles, and so the Islamic Republic is also at risk," Nasrallah said when asked what Khatami had told him regarding U.S. pressure to rein in Hizbullah. "The position is one of solidarity between the Islamic Republic, Syria, Lebanon, the resistance, the Palestinian people and all the honourable people of the Muslim community," he said. On Monday, Khatami called for liberation of the remaining Lebanese lands from Israeli occupation as he reiterated Iran's support for "legitimate resistance of nations." If people want on or off this list, please let me know. Iran is still part of the "Axis Of Evil." Mohamed Khatami's "moderate" rhetoric is purely for Western consumption. The true face of the regime is shown in its steadfast support for anti-American terrorist groups in the Middle East, like Hezbollah. 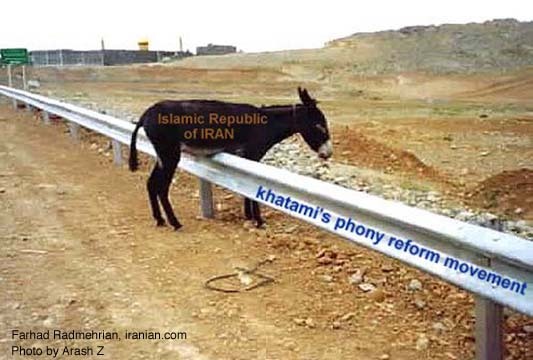 This is why we don't need to deal with those associated with Khatami inside of Iran. Forgot to ping you, but I see you made a great entrance already! With us or with the terrorists, time to choose. Guess the Iranians got the wrong message from Iraq. so it won't happen to them. Too bad.